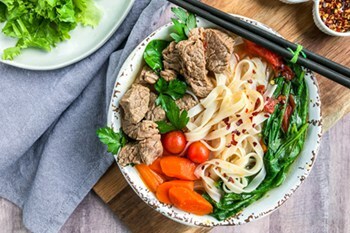 A bowl of this Asian Beef and Vegetable Soup with Pad Thai Noodles is comfort food personified. With tender beef and veggies simmered in a well-spiced, flavorful broth, it’s a fragrant soup you’ll want to make all season long. Heat oil in a Dutch oven over medium-high. Add the garlic and chili powder; cook until fragrant (about 30 seconds). Do not let the garlic burn. Pour in the water and bring to a boil; then reduce heat and simmer 3 minutes. To the simmering water, add the beef, ginger, green onions, carrots, tomatoes, brown sugar, sambal oelek, soy sauce; season with salt and pepper to taste. Add the spice pack (see note). Bring the soup back to a boil; partially cover, and reduce heat to medium-low to maintain a simmer. Cook the soup until the beef is tender; about an hour to 1-1/2 hours. Discard the spice pack. Meanwhile, before the soup has finished; cook the pad Thai noodles, according to package instructions, in a separate pan. Do not cook the noodles in the soup. Assemble the bowls: Place the noodles and spinach in each bowl. Pour in the broth and vegetables; then place the beef on top. Garnish with fresh coriander, cilantro or parsley, a drizzle of sriracha sauce for additional heat if needed, and red pepper flakes if desired. Assemble the spice pack in a square of cheesecloth tied with twine, or a closed tea strainer works wonders too. It makes it incredibly easy to discard the spices. Be sure to cook the noodles separately, according to package instructions, for the best flavor and consistency.